After a disappointing hitting display on Friday night, the No. 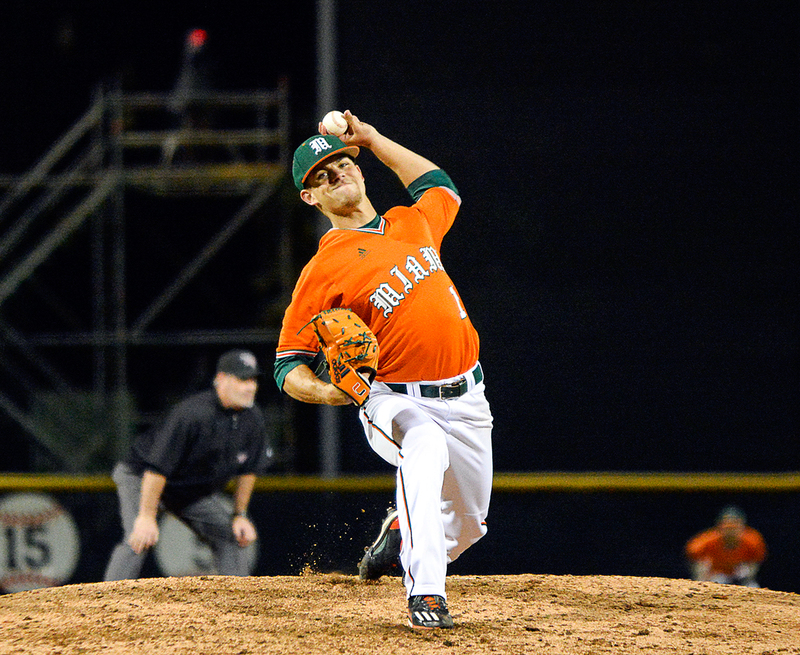 17 University of Miami Hurricanes turned things around, evening the series against Dartmouth on a thrilling yet controversial “balk off” in the ninth inning in a 3-2 win on Saturday night at Mark Light Field. Dartmouth (3-2) broke the stalemate in the fourth inning with back-to-back solo home-runs from Michael Ketchmark and Kyle Holbrook. The 2-0 lead didn’t last long, however, as Miami (4-5) responded with composure in the bottom of the fourth. Senior designated hitter Johnny Ruiz led off with a ground-rule double to left field but was thrown out trying to tag up to third on a fly out from junior outfielder Carl Chester. The Canes rallied back with a single from sophomore Romy Gonzalez and a walk from senior Edgar Michelangeli. The bases were loaded when Dartmouth starting pitcher Cole O’Connor hit Christopher Barr. Miami senior Randy Batista took advantage with a two-RBI single to left field, tying the score at 2 apiece. It was another great performance on the mound for the Hurricanes. Junior lefty Jeb Bargfeldt tied a career high with six innings-pitched in just his third Miami start. He struck out a career-high eight batters, allowing six hits. Freshman Albert Maury Jr. came in for relief, pitching two scoreless innings. He recorded two strikeouts and walked two to keep the score level. Maury Jr. has only allowed one run in his first five appearances as a Cane. Sophomore closer Frankie Bartow recorded his first win of the season after pitching a scoreless ninth inning. Gonzalez opened the ninth with a single to right field and advanced to second on a ground out from Michelangeli. He then advanced to third after a balk from Big Green pitcher Patrick Peterson. An intentional walk to Barr put runners on first and third with one out. On the ensuing batter, Peterson turned quickly to try to pick off Barr at first base but saw that first baseman Ketchmark was not on the base. A slight hesitation caused Peterson to throw a lofted ball to Ketchmark. Miami coach Jim Morris ran out onto the field pleading for another balk. After time for the umpires to talk and an argument from the Big Green head coach, the balk was given – Gonzalez came home, and the Hurricanes celebrated the win. Miami finally found a glimpse of its hitting stoke, out-hitting Dartmouth 8-6. Seven different Hurricanes recorded at least one hit in the win, led by Gonzalez, who finished 2-4 with two runs. Batista finished 1-3 with 2 RBIs. Miami will look to win the series at noon Sunday when the two teams return to Mark Light Field.